Home page > News > The systems of radiant heating. 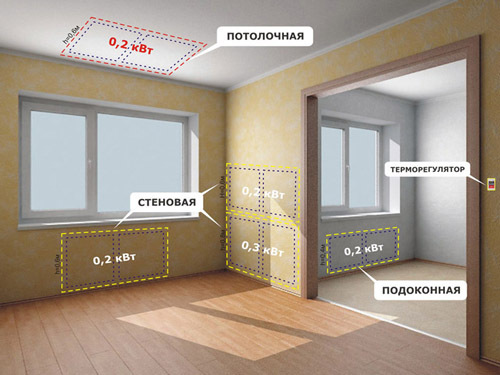 The systems of radiant heating. 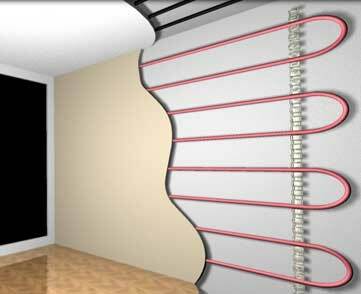 Radiant heating – is more natural and near to the nature of heat-exchange of the human the type of heating. Decades later it got a large amount of embodiments in new materials and constructions, and variations of heat-transfers. So called radiant panel heating became one of the first form, which was invent in earlier 1950 year by the engineer V.A Yahimovich. However active development of such systems happened only on the 50th years. Earlier the systems of radiant heating in generally consist of pipes, which were layed down in special concrete panels from them happened the name, but now such heating are presented with a thin and compact and the main by the mobile panels from different materials beginning with the metal and ceramic. Today radiant heating more often is mentioned as a synonym of infrared heating, that is right in common, because main point of the first and the second consist in radiation of heat waves of infrared spectrum, which are not absorbed with the air, but achieve, directly the subjects. On a row with the more usual heating – radiators, air convectors or with the using of boilers, ovens, and so on infrared heating always was separated not only with the heating method, but a quick and easy installation and minimal expenses on the heating and support of the system. 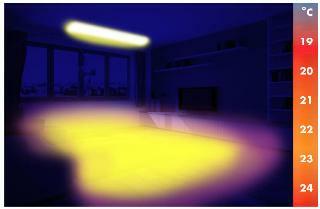 In Europe, where safety of the resources and economy has the special meaning at the last years, systems of radiant heating are considered more safety and profitable way of heating, because infrared panels don’t only save your costs by means of accurate control of heatgiving, but the positively influence on the microclimate in the premise. The certain attention earns such peculiarities as absence of strong air flow which is usually accompanies to other kinds of heating. Air masses don’t heat directly that means that dust and microorganisms will not up and actively circulate in premise. Earlier the pipes set in the walls where the hot water was circulated. Radiant heating, for some reason, considered natural and more suitable for man, because usual for us sun rays heat earth at such principle as infrared source of heat. Rays reach protective constructions, hard surfaces, penetrate in them on the depth 3-4 cm and return its warm. At this radiant-panel heating has possibility equally to radiate the heat, which is equally absorbed by premise. Man at such system of heating feels, for example, temperature 20 degrees of heat, at this the real air temperature is 17-18 degrees. In a such way, we can considerably save at the heating, because this method shorten spends at the energy sources to 50 %. Wall, ceiling and under window’s panels of radiant heating. For today the systems of radiant heating give possibility to create the warm floor in premise, to heat full or zonal area even in the multi-structured premises, and to set heating equipment between the walls and in the ceiling overlap. This allows to improve the esthetic way of premise, to make sources of high temperatures safety and unavailable for chance touch. Heattransfer in the system may be water, electricity, rarely steam or hot air. At the construction dominate thin film heating systems (with the sewed in cables) or separate heaters with THE which you can connect to the one system and create economical radiant heating. Infrared film is convenient by its flexibility – it is strong and super thin heating system, which is set under any materials for covering and finishing (tile, parquet, dropped ceilings and other). Temperature of the surface of warm floor mustn’t high 26 degrees, for man feel himself comfortable staying on it. Panel-radiant heating is especially comfortable to use where there isn’t repair works or if there isn’t wish to put in the floor or ceiling cable systems. In a such way we can address to infrared heating systems, which are easily creates with the help of correctly choosing number of ceiling and wall heaters. These panels are very easy installed in premise and tuned on the necessary regime of work with the help of installed thermoregulator. Systems of radiant heating can be used as in the household and in industrial spheres, because flexibility of settings and individual approach allows to match certain microclimate, accounting all peculiarities of the premise. Infrared heaters Teplov – equipment of the leading company on the Ukrainian market, which creates and develops technologies of radiant heating in the best European traditions, more than 10 years. Panel-radiant heating created with the help of such equipments, serve not one decade for the benefit of your house, office or plant.